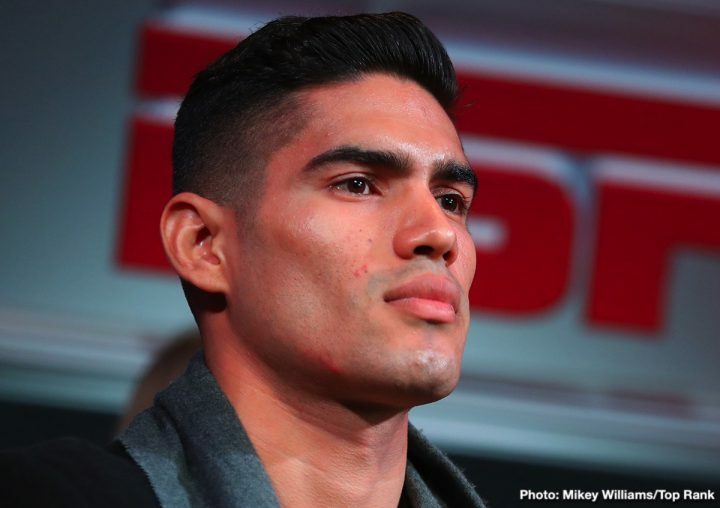 By Chris Williams: Top Rank promoter Bob Arum took a shot at Saul Canelo Alvarez this week in saying that his fighters WBO super middleweight champion Gilberto ‘Zurdo’ Ramirez (38-0, 25 KOs) and Jesse Hart (25-1, 21 KOs) would both beat the Mexican star. Ramirez, 6’2″, is defending his World Boxing Organization 168 lb title tonight against Hart in a rematch on ESPN+ at the American Bank Center, Corpus Christi, Texas. The Ramirez-Hart 2 card starts on ESPN+ at 10:00 p.m. ET. “Best fight this weekend is Friday night’s clash on ESPN+ at 10pm ET for WBO super middleweight championship between Zurdo Ramirez and Jesse Hart. Each guy would beat Canelo Alvarez!” Arum said on his Twitter. You can argue that at least by Canelo fighting Gilberto Ramirez for the WBO title, he would be fighting for a REAL title, and not the WBA’s secondary trinket title that they have at 168. The WBA’s real champion at super middleweight is Callum Smith. If Canelo wanted to win a true title in the 168 lb weight class, he should have picked Callum or Gilberto. Picking Fielding as the opponent just makes Canelo look like he’s padding his resume to win division titles the easy way without risk. Canelo wants to a win a third division world title, but picking Fielding instead of Gilberto or Callum will cheapen the accomplishment. With Canelo talking about wanting to fight the best, he seems to be veering away from that motto by facing Fielding rather than Smith or Ramirez. Arum might be right about Ramirez and Jesse Hart beating Canelo. They’re both huge fighters with power and talent. Hart has the kind of punching power that would trouble Canelo. The uppercut that Hart likes to throw is arguably better than Gennady Golovkin’s, and Canelo was hurt by him in the late rounds of their rematch. Hart would be a real problem for Canelo, as would Ramirez. In fairness to Canelo, he’s not a super middleweight, and he’s short even by middleweight standards at 5’8″. He’s one of those stocky fighters that has a lot of weight, but not much height. Those type of fighters do well when they have hand speed and defensive skills like Canelo. But asking the Mexican star to take on big super middleweights with power and skills like Hart and Ramirez is kind of unfair to him. Canelo hasn’t even established himself as the best middleweight yet, let alone someone that is capable of beating the best at 168. Fielding is arguably a cherry pick by Golden Boy for Canelo. They saw a vulnerable champion at super middleweight that holds the WBAs lower level/secondary title, and they obviously thought it would be a great idea to help pad Canelo’s resume the easy way without having him risk his neck against any of the talented champions in the 168 lb weight class. Ramirez and Hart had an action-packed fight last year in September 2017. It was a war from start to finish. It was one of the best if not the best fights in 2017 in the 168 lb weight class. Ramirez won the fight by a 12 round decision, but it was far from an easy win for him. Hart hurt Ramirez a number of times with his powerful uppercuts. If Hard had been able to land more than just uppercuts, he probably would have won the fight. He was too one-dimensional with his punch assortment on the night. A win for Canelo on Saturday night over Fielding won’t prove anything. I view it as the equivalent of an NFL team selecting a semi-pro team to beat up on, and then talk about how great it was to add that distinction to the record books. Canelo needs to be a little more courageous when going after different division world titles if he wants to get the respect from boxing fans. – Matthew Hatton: for the WBC junior middleweight title on March 5, 2011. The fight was a catchweight job. Hatton was a welterweight, and he moved up to junior middleweight to face Canelo for the vacant World Boxing Council 154 lb title. The WBC still sanctioned the Canelo-Hatton fight for their WBC junior middleweight title despite Hatton not being ranked in the top 15 of their rankings and never having fought in the weight class before. At the time, there was more than a little criticism from boxing fans about Canelo being able to fight a welterweight for the vacant WBC 154 lb title, and also him fighting at a catchweight rather than the full weight for the junior middleweight division. There were a lot of contenders in the WBC’s top 15 that should have been selected for Canelo to fight rather than a welterweight like Matthew Hatton. – Miguel Cotto: for the WBC middleweight title on November 21, 2015. Canelo fought Cotto at a catchweight of 155 lbs, and wound up beating him by a close 12 round decision. Cotto had recently won the WBC title in defeating the gimpy-kneed Sergio Martinez in a catchweight fight in June 2014. Canelo’s two division world titles that he won were not against the best obviously. Cotto was a good fighter during his prime, but he was never a true middleweight. You can argue that the only reason Cotto beat Martinez to win the WBC middleweight title is because he was old, coming off of 2 knee surgeries and a year long layoff from boxing. Had Cotto had to fight Gennady Golovkin for the WBC title, he likely would have been knocked out. The fans wondered by Canelo didn’t fight the best at 160 by taking on GGG in 2014 rather than selecting Cotto to win his middleweight belt. The way it went down, it looked like Canelo selected a vulnerable champion at middleweight instead of someone that could beat him like Golovkin. Gilberto Ramirez has been vocal about wanting to fight Canelo. Since Canelo was hunting for a third division world title at 168, it would have been the perfect opportunity for him to challenge Gilberto for his WBO super middleweight title to add another division world title to his resume. In hindsight, it was another bad move on Canelo’s part to select a weaker champion in Fielding to go after a title belt rather than a belt holder with talent.